Fiddlehead ferns growing in the wild. Give it up for spring. Slide into those flip-flops, spruce up the flower garden and drink a frosty beer at your favorite outdoor patio bar. Succumb to spring fever with the triumphant return of all the wild things growing across the South and the rest of the country. While you can find the holy trinity of wild spring tidbits — ramps and morels and fiddleheads — growing wild on your own, we like to leave the foraging to the experts and find these and other spring arrivals in our local farmers market or those particularly woke grocery stores with special local produce sections. Fiddleheads, nature's crunchy ... baby maker? A study in Tide Head village in New Brunswick, Canada, showed that 82 percent of births since 1966 have been in February and a naturalist up there, Richard Cliff, decided to look into the phenomenon. He found that fiddleheads, the curled-up edible frond of certain fern species we see this time of year, are consumed in the region much more than anywhere else and when he studied the chemical makeup of fiddleheads, he found that they're high in magnesium, iron, folate and zinc but also epimedium, which boosts both testosterone and estrogen levels in humans, thus making spring a particularly frisky time of year. So there you go. Granted, I have yet to delve further into the science but found this a fun little tidbit. The most common fiddlehead-producing fern is the Ostrich fern, found in wetter woodlands, but you'll also see Western sword and Lady fern, to name a few. When you pick up your supply this spring, consider preparing them simply, just sautéing with butter, olive oil and garlic, then sprinkling with sea salt like you would asparagus. I like to use my truffle salt and a little pepper. Cook until a wee bit crunchy. They're also great tossed with shrimp or lobster as a salad with a citrus vinaigrette, and I usually pickle a bunch of them to have as a side with barbecue, to put on top of a burger for crunch or with a meat and cheese board. Also known as wild leeks or wild onions, ramps (Allium tricoccum) are delicate and quite pungent. They have long, flat green leaves and little white bulbs, similar to a scallion. 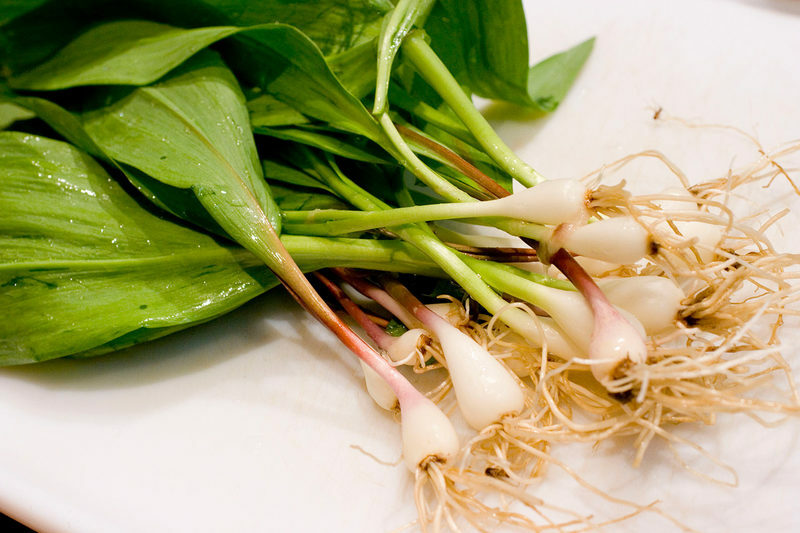 The name "ramps" comes from the Old English word "ramson," their term for allum ursinum, a garlic species used in salads. These are also great pickled, if you chop off part of the top leaves, or just toss the small bulbs with some of the greenery in a salad. I like to chop the leaves and saute them with butter, salt, pepper and some diced hot chili peppers as a side for roasted pork or a hearty fish like monkfish, even lobster. 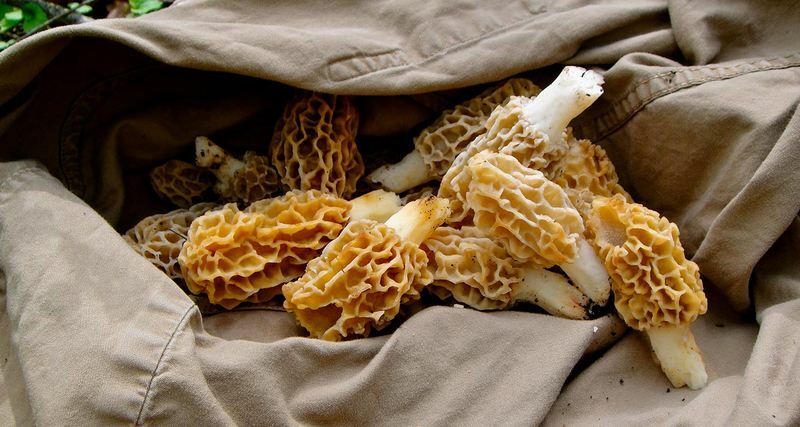 I also like to make a ramp pesto and use it all summer long tossed on pasta, and I'll tuck them into a roast chicken dish with another spring ingredient — morel mushrooms. A good morel is hard to find, but when you have them, they're the most prized mushroom of all, at least by me. I use them tossed with pasta, in salads (they must be cooked a bit) or simply sauteed, but I learned to make a wonderful dish from a Hungarian chef I worked for decades ago using sour cream. He just sauteed the morel mushrooms quickly in butter and added snippets of tarragon and thyme, then topped them with a few dollops of warmed-up sour cream and a sprinkle of smoked paprika. I use my morel cream sauce on grilled meats, fish or tossed with pasta. Even better, put a dollop on your scrambled eggs, another one of spring's best foods. Choose bright green fiddleheads with a tightly closed head. Place fresh fiddleheads in a bowl of cold water and wash.
Bring two quarts of water to a boil in a saucepan and add two tablespoons of the salt. Add fiddlehead ferns and cook for 10 minutes, stirring occasionally. Drain, then rinse the ferns with cold water. Set aside. Combine vinegar, 1/2 cup water, and remaining teaspoon of salt in a saucepan and bring to a boil. Add the garlic, pepper flakes, peppercorns and allspice, and remove pan from the heat. Add the fiddleheads to a clean jar and cover with the pickling liquid. 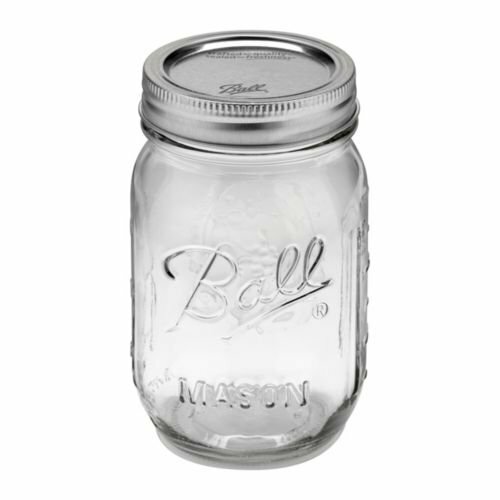 Use a boiling water bath canner to seal the jar and store for up to one year in the pantry or keep covered in unsealed jars in the refrigerator if using within a month. After about three days they're ready to eat, but waiting adds to the flavor. Heat a cast iron or other heavy skillet over medium-high heat and add the butter. Add the ramps when the butter is melted. Stir well and sauté until the ramps are wilted, about 3 minutes. Transfer to a bowl and let cool. 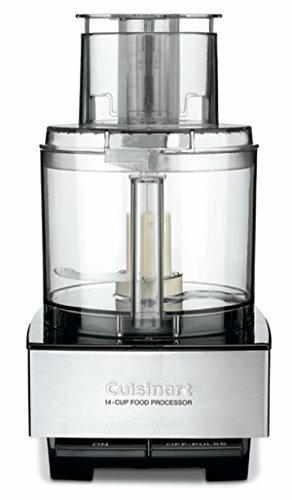 Place the ramps in the bowl of a food processor and add the cheese, oil, nuts, lemon juice and salt. Process until the mixture forms a paste, scraping the sides of the bowl as needed, about 2 minutes. Transfer to a storage container. You can use it immediately, refrigerate for about four days, or freeze. Melt the butter in a small saucepan over medium heat. When the butter is foamy, add the shallots and a pinch of salt and cook, stirring frequently, until softened and translucent, 2 to 3 minutes. Add the wine, bring to a simmer, and cook until almost evaporated, 3 to 5 minutes. Stir in the morels and cream, along with a squeeze of lemon juice and a few grinds of pepper. Bring to a simmer, reduce the heat to medium-low, and continue to cook until the mushrooms are tender, about 5 minutes. Remove from the heat and season to taste with additional salt, pepper and/or lemon juice. Serve immediately. This recipe is good for both ramps and morels, although you could omit the morels if you like. To make the chicken: Heat the oven to 375 degrees. Pat the chicken very dry with paper towels and season generously with salt and pepper. 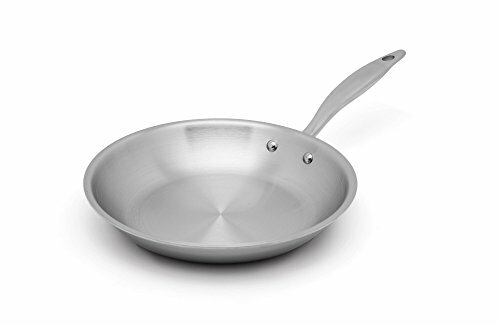 Heat the olive oil in a medium skillet over medium-high heat. When the oil is hot, add the chicken skin-side down and sear until golden brown, about 5 minutes. Flip, then add the butter and rosemary and tarragon sprigs. Let the butter melt, then baste the chicken with the butter. Transfer the skillet to the oven and roast the chicken until it reaches 160 degrees, about 5 minutes. Meanwhile, make the Parmesan sauce: In a medium saucepan, combine 2 cups of the stock, cheese rinds, rosemary, bay leaf, garlic, shallots and a pinch of salt. Bring to a boil over medium-high heat. Remove from the heat and stir in the lemon juice. Strain through a fine-mesh strainer into a medium bowl, pressing on the solids to extract all of their juices. Place the egg yolks into a second medium bowl and whisk in a small amount of the hot stock mixture to temper the egg yolks, then whisk in the rest of the stock. Return the stock mixture back into the same saucepan off the heat. Place over low heat and cook, stirring frequently, until thickened, without coming to a boil. Taste and season the sauce, if needed. Whisk in the grated Parmesan cheese. Transfer the chicken to a cutting board and let rest. Discard the herbs from the skillet, but reserve the fat. Place the fat over medium-high heat and add the morels. Let them cook for 1 minute, then add the ramps. Toss to combine. Add the remaining 1/2 cup chicken stock, bring to a simmer and cook, scraping up any browned bits from the bottom of the pan, until the vegetables are tender and the mixture has thickened. Remove from the heat. To serve, slice the chicken on the bias or diagonal and place the slices onto a plate. Top with the ramps, morels, and drizzle with the sauce. Season with salt and serve. Rachel Forrest is a former restaurant owner who lives in Austin, Texas. She can be reached by e-mail at rforrest@gatehousemedia.com.